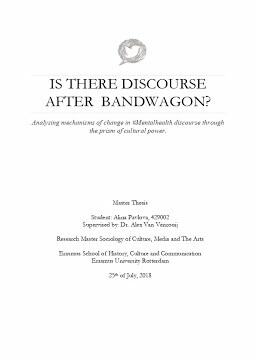 Erasmus University Thesis Repository: IS THERE DISCOURSE AFTER BANDWAGON? Analysing mechanisms of change in #Mentalhealth discourse through the prism of cultural power. IS THERE DISCOURSE AFTER BANDWAGON? Analysing mechanisms of change in #Mentalhealth discourse through the prism of cultural power. The global burden of mental health disorders on society increased steadily during the past decade. To date mental illness is the leading cause of total years lived with disability. Future projections of positive shifts in overall mental health measures are bleak. Global mental health policies and budgets fall short of addressing the societal burden as mental health discourse languishes in the shadows due to stigma. Bringing awareness to stigmatized topics for which the funding is scarce can be challenging. Online social movements can provide an answer to this challenge. The internet creates a safe environment for marginalized members of society to voice their discontent and create awareness. Social media activism can also drive offline activism and shape traditional media discourse. This thesis’ objective is then (1) to map the mental health discourse online and, consequently, (2) to analyse the mechanisms through which cultural power emerges online in the context of mental health narratives. To achieve these goals, this research employs innovative methods of topic modelling, sentiment and panel data regression analyses, and combines, in a multidisciplinary fashion, concepts such as emotional energy and cognitive focus from sociology and bandwagon effects from economics. The evidence shows that low-cost attention mechanisms are ineffective in fostering online mental health discourse, whereas emotional energy and discursive variability have positive influence by engaging the audiences, creating online solidarity and speaking to worldviews of audiences from different walks of life.